It’s a bit like watching the disappearance of my waistline and finding that last summer’s white trousers can only be closed with a mighty tug and the prospect of a button embarrassingly flying off in public. At the present rate of increase (with occasional low-carb diets) I shall only be really obese when I’m 75, and at present I don’t care about that: chances are it’ll be the least of my problems. Twenty years ago, the number of nights a bottle lasted me was an indication of how good the wine was: a really nice wine wouldn’t suffice more than two nights; a less seductive one would last three. Now, even apart from my being so fussy that if I don’t much like a wine I abandon it and go and find another, it’s decidedly not rare for a good bottle to disappear completely in a night – unless I switch to brandy at a later stage. I am, let it be said, not one of those who think that drinking by oneself is inherently problematic. Certainly, the majority of dinners in my adulthood have been consumed alone (even when I lived with someone, which I no longer do), and these are always accompanied with, and generally followed by, alcohol. I love the stuff. Alcohol, that is. Wine is a great accompaniment to food: that freshening acidity, that gulp of a different – hopefully complementary or confirmatory – complexity, and that added deliciousness in the sensual totality. But above all, I admit, it’s that added happy buzz…. Surely at least the vast majority of any readers who have forced themselves this far will know what I mean? And I’ve always found scoring a buzz a trifle problematic. So. Not having a fatted calf in my freezer I defrosted some duck-quarters to help my rejoicing. I am good at cooking them – not a great achievement, admittedly; a fatted calf would be much more of a challenge (and unlikely to fit in my freezer, unless it was a real baby). While I was doing so I even assembled some shelves for my garage from a kit, so blasé was I, but also, more importantly, went in search of something vaguely celebratory to accompany what I knew was to be a delicious dinner (ok, the potatoes fried in duckfat were not expected to be irrelevant to the pleasure). Something local and cabbish, I thought. I considered my last bottle of Morgenster 2000 (the maiden and sadly the best yet), but decided that that should be shared. 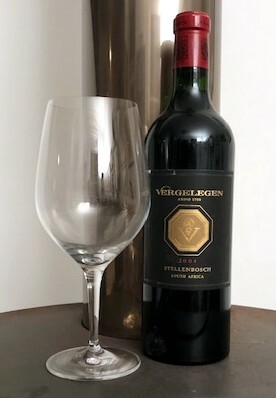 Then noticed a Vergelegen V 2004, which I thought should go well with my rather rustic ducklegs in red wine sauce (lots of garlic and rosemary too). And it did. To the extent that only the last dregs are in the glass as I type. Vergelegen V; just a little merlot and cab franc in the mix. Powerful, but not without refinement, I thought; a marvellous bouquet showing some real complexity; a palate still packed with fruit, and the tannins not fully resolved – quite assertive in fact, but exciting. The 100% new oak was never intrusive, and it still works well in fully-meshed support. A wine with time to go yet, and possibly to improve further. It proved very easily to be a one-night bottle, and an inspiring one: even if all it evidentially inspired was these words. Which I’d better check in the morning, I realise. Hi – Enjoyed your write-up. Sums up me to the T with the only difference is I do duck liver !! Love getting the buzz on with a 70’s Cape number and a bloody chunk of meat on the fire! Great piece Tim, As someone who shares your love of wine and drinking quite a lot of it alone,I can emphasise with you. You maybe reassured to know that I am now in my 70,s and showing no signs of reducing my wine intake. When you do get “old” you tend to believe that whatever may have done you harm in the past,is unlikely to have much affect now. If fact my doctors basically tell me to carry on now as I basically have all my life.